Come to Boston for Biojustice 2007! 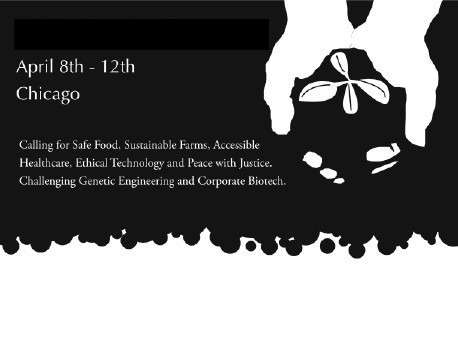 BioJustice 2007 is a week long celebration of sustainable food and alternatives to corporate healthcare. 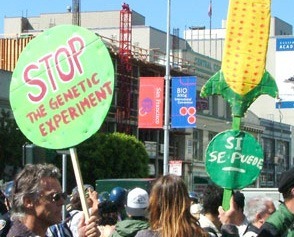 It is being developed by a wide coalition of public interest groups, activists, farmers, scientists, and concerned citizens, working together in response to the biotechnology industry’s international convention scheduled for the new Boston Convention and Exhibition Center during May 6-9, 2007. Audio from Reclaim the Commons 2006 in Chicago is now available at http://radio.indymedia.org/news/2006/04/9413.php. The featured panel discussion took place on April 8, 2006 at DePaul University, in response to the BIO industry convention held the following week in Chicago. On the panel: Anuradha Mittal (Oakland Institute), Carmelo Ruiz-Marrero (Puerto Rican Project on Biosafety), John Kinsman (National Family Farm Coalition), and Sarah Alexander (White Earth Land Recovery Project). The panel was moderated by Jeffrey Smith (Institute for Resonsible Technology). The Biotech Industry Organization (BIO) is coming to Chicago this April for their annual international convention and PR extravaganza BIO 2006. The world’s largest convention of biotech and pharmaceutical executives is coming to Philadelphia this June. Join us to resist their closed-door corporate agenda of GE agriculture, health care for profit, and bioweapons proliferation. Give voice to a different vision of local food sovereignty, fair trade, health care for all, community power, biodiversity and honest science. CALLING ON ALL PEOPLE who resent the demise of democracy and hold to the promise of authentic popular empowerment! 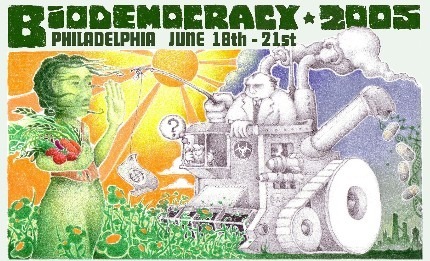 All who dare to paint poems of resistance on walls of oppression, dance in city streets in defiance of police states, and plant seeds of sedition in the shadows of Empire: come to Philadelphia! As the world’s leading agents of eco-devastation and medical malpractice meet here in June, we cannot stand quiet. 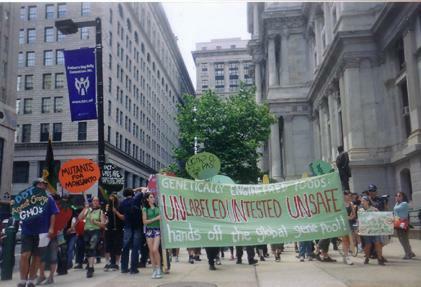 Join us to challenge the corporate crime, poisons for profit, and flagrant lies of the biotechnology industry, at the time of their annual international convention, with a creative uprising for truth, life and justice! From this point on, we recommend clicking on the individual events in the right-hand column, rather than continuing to scroll through the archive from this page. Posts on this page are organized by date of re-posting and will not necessary follow the most logical sequence. June 21st Day of Action info. Biodemocracy Summer Solstice Day of Action, June 21, 2005, with actions focusing on Healthcare for All, Environmental Justice and Sustainable Agriculture, and Bioweapons and War.